Call it what you may; Arsenal deserved all the plaudits for their emphatic win over Blackburn at the Emirates Stadium. With temperatures falling below freezing point, Arsenal turned on the heat, with a display that would silence all their critics for sometime. There was a minor flutter in the stadium, when Arsene Wenger selected midfielder Francis Coquelin ahead of first-choice right-back Bacary Sagna. Aaron Ramsey was given a rest, Tomas Rosicky taking his place, and Oxlade-Chamberlain handed another start, after he passed a late fitness test. With pre-match talk involving disgruntled supporters planning a unique protest during the game, by applying rubbish bags on empty seats, the club managed to still attract 59643 supporters, despite the underground Victoria Line shutting down, which initially preponed the fixture by a couple of hours. Arsenal started in the best possible manner, with Theo Walcott making most of a good Rosicky ball, and assisting van Persie to score after just 80 seconds. Arsenal mustered 7 more shots on target, with Oxlade-Chamberlain and Walcott in marauding mood, in the next half hour, but conceded a goal in the 31st minute. Completely against the run of play, Laurent Koscielny conceded a foul on Blackburn new boy, Anthony Modeste. Morten Gamst-Pedersen struck a wonderful freekick to get the visitors back on level terms. 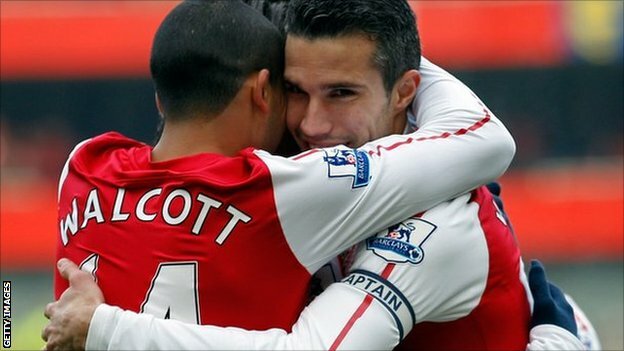 But it lasted just 7 minutes, as Walcott and van Persie partnered again, to score the Gunners’ second, very similiar to the first. And a couple of minutes later, the captain turned provider as his delightfully waited ball was emphatically finished by 18-year old Oxlade-Chamberlain, by rounding off Blackburn goalie Paul Robinson. Blackburn were the architects of their own downfall. Gael Givet lunged madly at van Persie, and was sent-of.. There were concerns about the well-being of the Dutchman, but he came on to action soon. The second half began, just like the first had ended. Mikel Arteta scoring in his 3rd appearance against Blackburn this season, with a fine volley off a headed corner. Oxlade-Chamberlain made it 5-1 with another calm finish, whilst being under pressure. van Persie got his well-deserved hat-trick 8 minutes later, with a wonderful tap-in off a Coquelin cross. Arsene Wenger then used his options on the bench, and replaced Chamberlin, Koscielny and Song with Henry, Sagna and Benayoun. Arsenal heaped more pressure on Blackburn over the next half-hour, but Grant Hanley showed remarkable maturity on some occassions. But, the bubble burst once more, as Thierry Henry making most of a Blackburn error. He fed van Persie and the selfless Dutchman, played the ball back to Henry, whose deflected shot met the back of the net. Some reprieve for all Gunners. Next up, a trip to Tyne-Wear to face a tricky Sunderland. Szczesny (8) – Had little to day on the day, but could have conceded a penalty on one occassion. Coquelin (8.5) – Another composed performance out of position. Mertesacker (8.5) – Towering performance. Koscielny (8) – Conceded a needless free-kick, which resulted in the goal, otherwise flawless. Vermaelen (8.5) – Another dogged display. Song (8.5) – Won the ball on many-an-occassion. Rosicky (8.5) – Could have finished better a couple of times. Replaced the rested Ramsey well. Arteta (9.5) – Near-perfect from the Spaniard. Walcott (8.5) – Probably, his best game of the season. Oxlade-Chamberlain (9) – What a player he is turning out to be for Arsenal. van Persie (10) – 3 goals. 2 assists. ‘Nuff said. Henry (8.5) – A Premier League goal after 1827 days. Deserves an 8.5. Sagna (8) – Surely on the starting line-up, next game onwards. Benayoun (8) – Had little to do, in a battle already won. Previous: No Van Persie for Blackburn, Theo Walcott to start as striker?